Two final tables today, though small fields in both games. But I love PLOH/8! It finally happened. Not the outcome that you want. I sure thought he was going to call, I mean he had lost money from 10 by calling calling calling. But I don't care. In all my years of playing poker, I have finally hit a royal flush. very good results. but I hope to get something big $ 100-200:). continued success. Lots of good things from today. 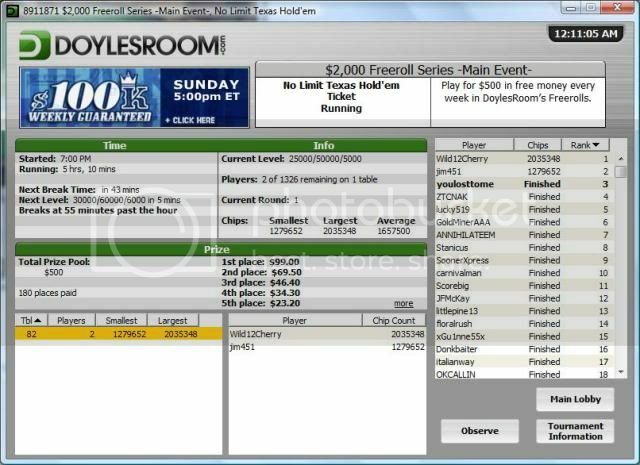 And won a ticket a few days ago at Doyle's with their 2K series, played in the $500 tonight. Was doing okay until this hand where I picked up my steam. 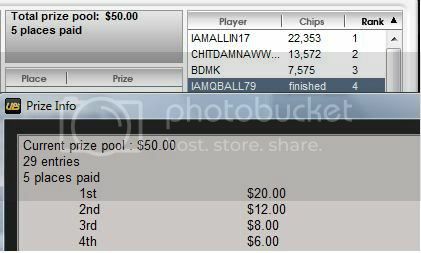 Check out how crushed the chipleader was, but then check out how he came back, but a very nice finish overall for me. Great finish in the 2K. Getting the bankroll built up is always a good thing. I dont play there but congrads... I rather new here too... my best finish is second... good job hope to run into sometime at the tables! I wish I could have made it farther, but I'm happy to have made it this far! Only 12 bucks winnings, but that's better than nothing. I am feeling very pessimistic about my future with online poker at the moment. 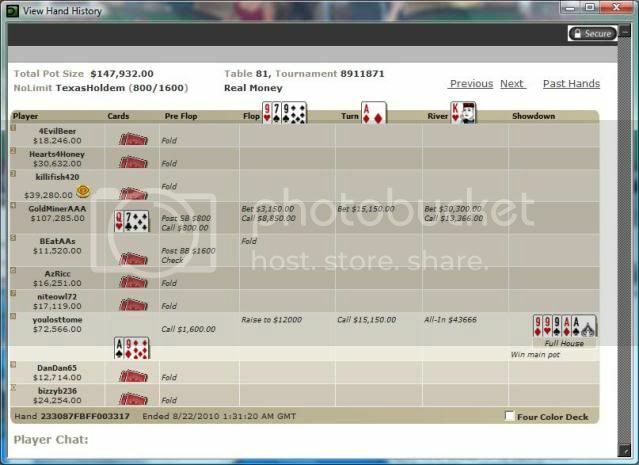 I have lost another poker site. Doyles will not allow me to log in anymore, due to where I live. The laws haven't changed, I haven't moved, it's just an example of the site trying to play catch-up. They allow you is for so long, then BLAM! they slam the door on you. They didn't notice me, and then all of a sudden they did. Cake did it to me a while back, I suppose it was just a matter of time. I just wonder who's next? Being a non-depositor, I've put in a lot of hours trying to win a little bit of money, and if you follow my wins, I have some that are at least a little impressive. The more time that passes, I just feel that it's all for nothing. With a growing family, I don't have those hours anymore to start fresh somewhere else. I've already emailed support, to no help, about cashing out. One option is a check, but the minimum amount is $500 (don't have that much in my BR), then 2 online wallets, which I don't have an account at either, but one fee is astronomical, and the other is a bit high for the amount I would be getting. So I'm left thinking what the value of all my time spent playing at doyles (OFC's, 2 PFO leagues, all cash tables, other private games) actually is - nothing. And is the same thing going to eventually happen at my other sites? Typically in these cases they allow you to cash out without the minimum. I'll try to find out what's going on. I do read that some laws change this days and now washington is banned from Stars, i do remember that Kentucky was banned way back in time from several sites, not sure about cake policy in that matter. I have become very inactive lately with poker, so much that this is the 30th of the month, and my first post here since early October unless I'm forgetting something. Over the time that I have been a member here, I have learned a lot about my game, and have improved several areas of it. 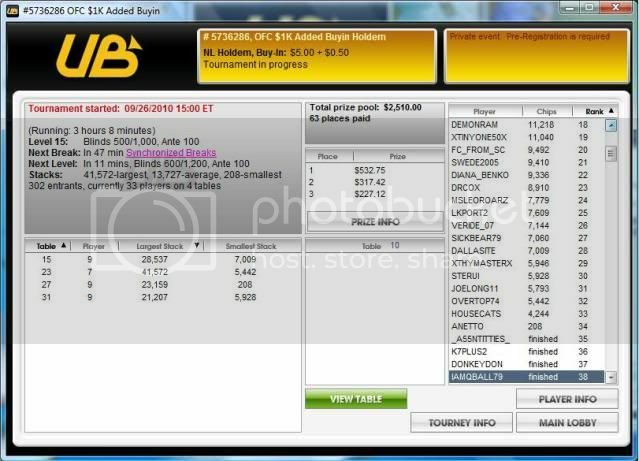 But in the recent history I have learned that while online poker may be a way for many people to earn a little extra cash, or even to fund their retirement, neither of these will be the case for me. I had worked from $0 to over a $100 and very close to $200 at a couple of different sites, only to have either the site vanish in the night, or block the area that I play from. Then I had a few other sites that I had a little bit of money on, but not nearly $100. It has left me discouraged so much that I don't want to even play online anymore and chase the "dream." I just simply gave up. When I thought about the hours, the hooooouuuuuurrrrrs I've spent playing poker online, and for it to come to this, it made me sick, but I decided to dump all my money at every site. And let me tell you, it was hard, it was sad, but it was cathartic, and I now feel free. I no longer feel obligated to sit in front of a monitor for an entire night, I no longer feel the need to track my wins and losses, and more importantly, I now have a lot more time to spend with my family and friends. And hopefully I will take my live games a little more seriously since it's all I will be playing. Cheers to everyone here, and hopefully you can make something off the online world! b you are one of the people i like and respect most on the forum. i started like yourself playing freerolls and chasing the dream. enjoyed the wins early and got frustrated when 4 sites shut down with my money. i learned there is a risk of this happening but i try and stay within the more reputable sites now. just want you to know your time wasn't wasted, i think you honed your skills and met some people that enjoyed your company. i think your a solid player who would make some cashouts every so often to compensate your income, its a tough game to make big money for people like us, a little money is nice and gives a sense of accomplishment though. would like to see you take some time off and reconsider but thats not up to me. regardless of what you do i wish you and your family the best life has to offer, poker is a hobby of mine but nothing compares to family. hopefully hear from you again, even if no longer playing stop by once in a while, best wishes. This past August my family took a trip to Myrtle Beach. We found out there was a casino cruise boat close by. Had to. Got there, talked to one of the dealers, and signed up to play a freeroll, or should I say, tip the dealer 10 bucks to play a freeroll. But figured what the hell? Couldn't gamble on the way out anyway, so might as well do it. Long story short, 23 people, 1st paid $100, 2nd payed $50. Ended up easily, or at least it seemed so, making it to heads up. 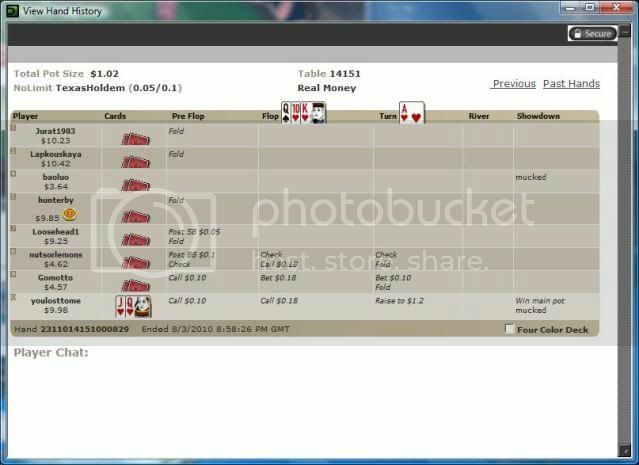 We played out maybe 6-7 hands then took her out with pocket 9's against her AQ. She was a total stranger, and after the game, she complimented me on my playing style, which felt good, especially since I hadn't played in a long time. Went on to play 2/5NL after the freeroll. First time ever playing a cash game, really. Did alright until I got QQ. My mistake was under playing them in early position. I only raised 4xBB, which wasn't enough for this table. 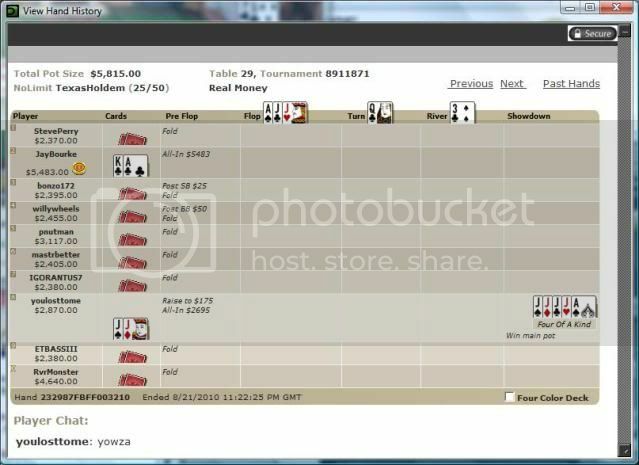 Got 1 caller, who flopped 2 pair (he was playing a suited J8). I was trapped, and didn't realize it. That hand took out a good chunk of my stack - 80 bucks or so. 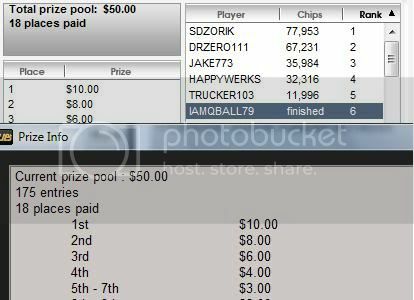 And I hung around for a bit after that, but had my fun and with the money from the freeroll, didn't lose too much on the trip. When I got up, that same lady told me I needed a break! i really enjoyed going on these boats when i lived in florida. cool to see that you still got game after not playing for so long.congrats on the cas too. just because im broke doesnt mean i cant play.